Each night of the show this pair are working tirelessly to ensure a seamless production of Imigéin - curtains go up, set changes and props are put in place. Meet Des and Gemma Hurley, the backstage team! Des has been a full time member with the Siamsa Tìre company for the past 22 years and now holds the position of Technical manager. Apart from his stage management duties Des has appeared in the repertory work of the company including its ‘Theatre in Education’ programme and has toured and performed extensively with Siamsa Tìre throughout Europe and America. He has received numerous nominations and awards for Technical Support in various musical productions. Having completed her Degree in Folk Theatre Studies, Gemma has been a part of the technical team for seven years and last year was appointed company Stage Manager. Apart from her Stage Management duties, Gemma also looks after costumes for the company. She has huge interest in stage lighting and during the winter season she also works in this department. 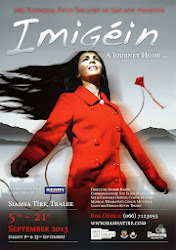 Gemma is looking forward to working as stage manager on the new production of Imigéin.